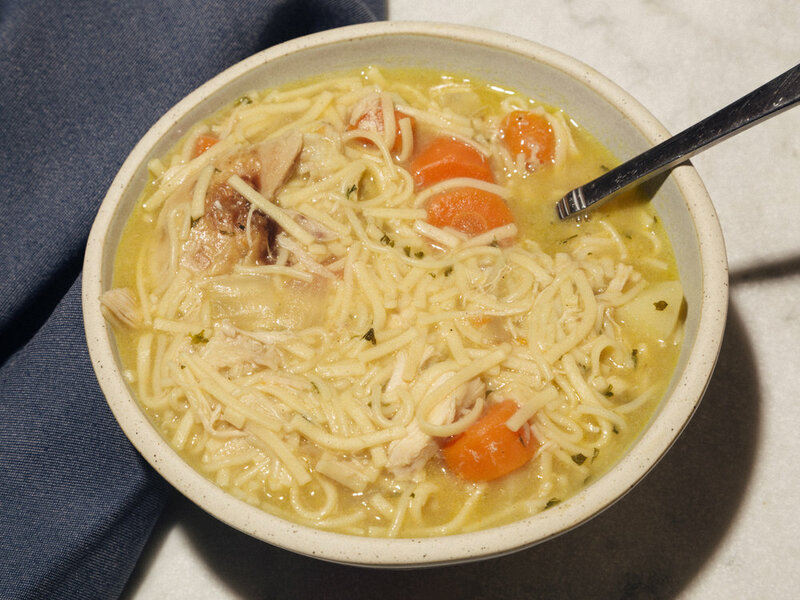 When I think of winter food, all I can think about is my grandmother's homemade chicken noodle soup. It's just so flavorful, brothy, warm, and delicious. It can get you back on your feet when feeling sick. You can add any vegetable to this soup but this is the traditional way I was taught to make it! Make a big pot - believe me you'll want to be slurping on this soup all week long! 1. In a large pot, over high heat, melt butter, add onions. 2. Cook onions for 7-8 minutes until translucent and soft. Add carrots, and potatoes and cook for an additional 4-5 minutes. Season with salt and black pepper. 3. Add equal parts of water and chicken stock. A total of 4 quarts - 16 cups. Stir the soup, and let it come to a boil. 4. When the broth starts boiling, add shredded chicken. Reduce the heat to medium-high heat, let the soup simmer for 15 minutes. 5. Add crumbled noodles, dried parsley, lemon juice, and salt to taste. 6. Cook for an additional 10-12 minutes. 7. Taste the broth, and adjust the amount of lemon, and salt to taste! 8. Enjoy a bowl, and share with your loved ones!